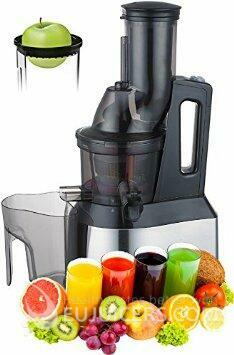 This juicer is available in most EU countries under different brands and names. It is aggressively promoted, sometimes using illegal tactics. We can recommend this juicer only for fruit. Although this juicer is promoted as having a powerful 500 W motor, we found this figure misleading, as the motor often stops while juicing hard vegetables. The feeding tube is larger than in standard vertical models, but it isn't as large as you might expect. For example, we tried fitting a normal-sized apple but had to cut in into quarters. Because larger pieces of produce are cut by the blade on the auger, a lot of force needs to be used when feeding the produce. This negates the main advantage of a vertical juicer: self-feeding of ingredients. If you want it to self-feed, the produce needs to be cut into very small pieces (thus negating any advantage of the wide feeding tube). The pusher doesn't reach all the way to the auger, creating an area of "dead space" where mashed fruits and vegetables accumulate. This makes cleanup more difficult and also results in lower yield. This juicer is neither easy or enjoyable to use. The quality of materials in its construction are rather low, and compared to other juicers it is much more difficult to assemble and disassemble.